Then its on to the prep! Cut your Granny Smiths in half and use a melon baller to scoop out the insides. Make sure the walls are intact and about 1/2 to 1/4 inch thick. No one likes a browning apple so squeeze the juice from the lemon onto the apples and let them set. Next, in a sauce pan over high heat, add the brown sugar, butter, heavy cream and corn syrup. Stir until the brown sugar has dissolved. Then leave it to boil, untouched (that means don’t stir), until it reaches 230 degrees or about 7-10 minutes. Remove from heat, add the vanilla by stirring until it stops bubbling and then allow to cool for about 10-15 minutes. Now it’s time to introduce your tasty caramel to your delicious apples. Using a paper towel to wipe your apples down, remove the lemon juice as much as possible, paying extra attention to the inside. (Unless you particularly like chasing the caramel sliding out your apple…in which case we get it – Earn them calories!) Pour the caramel into the hollowed out apples until just below the top and sprinkle with the crushed pecans. Next, pop them in the fridge to chill and so the caramel can set. About 20 minutes’ll do ya fine. 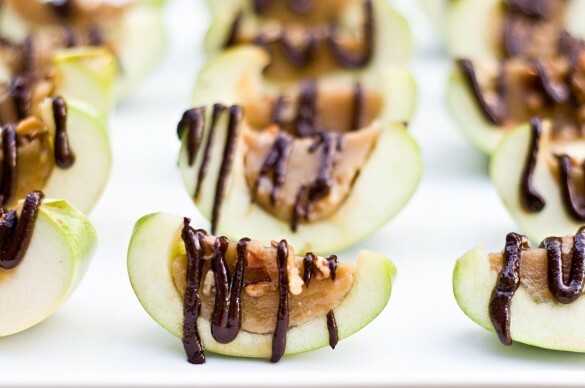 Once you’ve mustered enough patience to wait the full 20 minutes of chillage, remove the apples, cut into sassy little slices and drizzle with the chocolate sauce. VOILA! A carnival and Halloween favorite turned deliciously inside out! Healthy isn’t really what this treat is all about but what it lacks in nutrition it whole-heartedly makes up for in scrumdiddliumptousness. So toss the stick and forget the poor apple-to-caramel ratio of days gone past and relish in the glory of this bite-sized repurposed favorite. With delicious ingenuity like this, we think even ol’ Granny Smith would approve. Next post The Great Pumpkin Pizzazz!